With the move from Stourton to Honington it now puts us within a 10 mile radius of Stratford, and as I was born and bred in Stratford I thought it would make more sense to have a specific section for local businesses in Stratford. 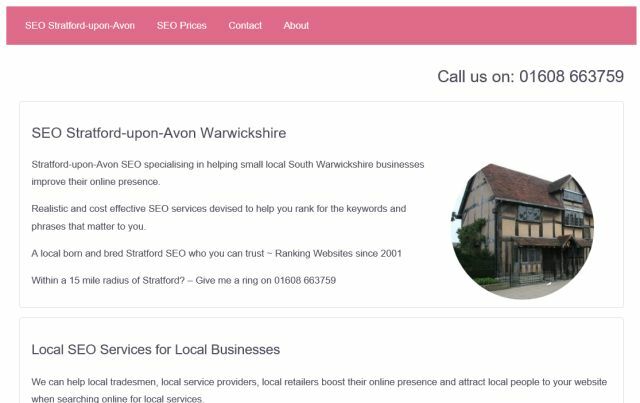 I also updated the Website Designers Stratford-upon-Avon but to be honest it is a bit of a mess at the moment. Hopefully, over the coming few days I will get that updated too. Whilst updating the new site I also tidied up the information about Optimized Mini Sites a concept I have been playing with for over a decade now for my own sites but have recently branched out to offer to others. If you are a local Stratford or Shipston business who would like one of these little sites feel free to give me a ring on 01608 663759.